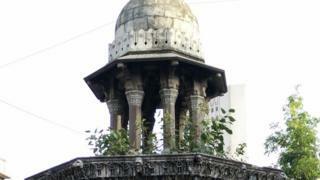 Image caption The Mulji Jetha fountain in South Mumbai before restoration. It is one of at least 50 colonial-era fountains in the city. Metallic sheets barricade the approximately 15ft (4.5m) drinking water fountain (pyaav) outside the postal headquarters in south Mumbai. Dozens of pigeons are jostling in the small courtyard-like space in front of it as the rain pelts down. Rahul Chemburkar points to the uneven ground where they have been trying to excavate to the original level of the structure. The mini minaret-topped fountain, known as Kothari Pyau, is currently being restored and the stone face cleaned. "It had been encroached and had lost its identity," says Mr Chemburkar, whose architecture firm Vaastu Vidhaan Projects is working on a number of heritage projects. "Working on it was like an archaeological exercise. And when something gets revealed, a small part of history gets unravelled." Mr Chemburkar is on a mission to further reveal parts of the city's history. Last year he set up the Mumbai Pyaav Project, an initiative to draw attention to the legacy of the city's water fountains - not just as heritage items but also as socio-cultural artefacts representing a certain way of life. "They were built not merely as utilities but also for aesthetic value. That is why they need to be preserved, conserved and revived," he says. Mr Chemburkar has also worked on recovering three other fountains, and he has two more restoration projects in the pipeline. There are at least 50 colonial-era fountains in Mumbai. Most of these are in gardens, along former tram routes and in accessible public spaces. Some have been destroyed over time through neglect, or infrastructure projects. Image caption The Mulji Jetha fountain in South Mumbai after restoration. Mumbai is best known for its impressive neo-Gothic and Indo-Saracenic colonial-era buildings. Examples include the city's high court, the university of Mumbai, and the Chhatrapati Shivaji train terminus. These have been lovingly restored and cared for, but lesser known urban structures have not fared as well. "These are smaller pieces in scale but still very significant," says Vikas Dilawari, a prominent conservation architect in the city, pointing out that these were the structures that people saw everyday. Mr Dilawari is also at the forefront of restoring Mumbai's fountains and heritage structures. He is in charge of rehabilitating the city's iconic Flora Fountain, a 32-foot structure brought in 1868. It is an especially grand example that stands at a busy intersection in a precinct crowded with heritage buildings. "Fountains were located at road junctions to celebrate the city and its architecture and they were part of the street-scape," says Mr. Dilawari. "These became the hygienic drinking sources in the mid and late 19th century." Until then, water had been sourced from drinking wells. Flora Fountain was positioned here at a time when the fort walls were coming down and new urban development was under way. Mr. Dilawari says fountain building "caught on like a craze". With restoration drawing to a close, it is almost ready to be unveiled. This is the fourth such project for Mr. Dilawari, who also worked on a nearby drinking water fountain called Mulji Jetha. That became functional after they restored its water engineering. "Cracking the water engineering was like cracking the Rubik's cube," says Mr Dilawari. "We did it through trial and error." Over the past few years, Mumbai has begun increasingly paying attention to its water heritage with several such rehabilitation projects under way. Built with funding from wealthy citizens, the city's fountains date back to the late 19th and early 20th Century and were of two broad types - the grand, monumental fountains and the smaller ones which focused on providing free water as acts of philanthropy. Over time they fell out of use as piped water started to become available in people's homes. The ornamental fountains were usually tiered affairs with upper trays that had water spouts and a lower level water trough that collected the surplus for animals to drink from. Most had a crowning element: a dome, a finial or a figurine and were built from different types of stones. Image caption A restored fountain in Mumbai's Rani Bagh, a heritage botanical garden in the city. The Mulji fountain was restored with funds from the Kala Ghoda Association, an active citizens' group in south Mumbai. The same group also funded the restoration of an adjacent fountain built in 1873 and located in nearby Horniman Circle. "We can't allow our built heritage to collapse," Maneck Davar, chairperson of the Association tells the BBC. "Our association was founded with the intention of preserving art and heritage in the district." Though many of these projects have been initiated by the city's civic body, which owns the land on which these fountains sit, some have been revived by the engagement and funding from proactive groups and citizens. Another of Mr Chemburkar's projects, the Keshavji Naik fountain, was funded by a private-public partnership. Mr Chemburkar recalls getting a call once in the middle of the night from an alert citizen about an impending fountain demolition, which he managed to avert in time. He has also submitted a report to the civic body with recommendations on mapping existing drinking water fountains, bringing back their water dispensing function and highlighting them as tourist attractions. The hope is to restore and revive the fountains to their original glory and purpose - not just pretty pieces of art, but usable monuments.